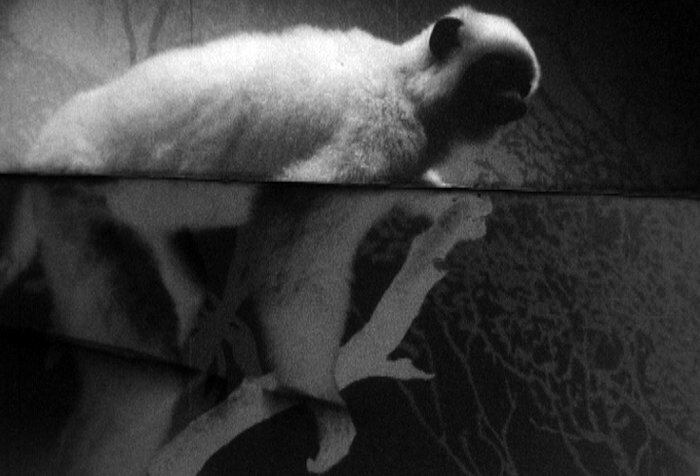 Close-Up and Unconscious Archives are delighted to present a selection of recent 16mm films by Berlin based artist-fillmmakers Anja Dornieden and Juan David González Monroy - including their dual-projector "Traumatoscope" performance New Museum of Mankind. As OJOBOCA, Dornieden and Monroy practice an audiovisual system of Horrorism - a simulated method of inner and outer transformation by audiovisual means. Their work encompasses experimental artist films, multi projection and live sound performances, installations and artist film workshops. Driven by new narrative cuts ups their filmic journeys take them from Germany to Indonesia, and reference Victorian photographic media and the slide show through screen-seance. Since 2010 they have been key members of the artist-run film lab LaborBerlin, providing access to artist film equipment, and facilitating workshops and screenings. Physiologically affective, OJOBOCA’s oeuvre of flicking cinematic and sublimely dissolving film frames evokes dark dystopian undercurrents that permeate our collective subconscious. Following the screening, Anja Dornieden and Juan David González Monroy will take part in a Q&A hosted by Unconscious Archives’ Sally Golding, including a discussion of their experimental filmmaking techniques and their activities as part of the artist run film coop LaborBerlin. In 1984 a giant cloud shrouded the town of Hüllen-Hüllen in darkness. One month later the town was abandoned. A search led investigators to a cave on the outskirts of town. Inside a machine projected a series of images onto every surface of the cave. For the sake of preservation the images were transferred onto 35mm slide film. Along with the machine a sheet of paper covered in handwritten text was also found. It was titled “Wolkenschatten”. The masked arts of Indonesia are thousands of years old. They are commonly referred to as wayang topeng (wayang: shadow or puppet; topeng: mask). It is believed that wayang topeng originated from tribal death rites, where masked dancers were considered the interpreters of the gods. In the lowest rungs of Javanese society a unique manifestation of these masked traditions can be found. Its practitioners are performers, but they are not merely entertainers. Their aim is not simply to amuse. Their ambition is to be respected, to be honored, to be successful. They have embarked on a path they know will lead to a higher state, to an honorable and noble position. In the museum a world of possibilities presents itself to the open and focused mind. An immense number of scenes can be created to appease even the wildest of imaginations. With the help of the Traumatoscope the following test will guide you through the most common scenarios you will encounter and give you the tools you will need to persevere in your mission to create a new museum of mankind. "A distinguished flea hypnotizes the ghost of a distinguished man" is the jumping off point for this terse Burroughs style gothic cut up. Part flicker film, part regression therapy tape, this experimental short film invites the viewer into an otherworldly vortex involving invocations of Freud and Mesmer in "a very special séance."